All Full Custom kits are made out of 21mil MX Vinyl and Include Shrouds, Preprinted Backgrounds, Air box, Fork Guards, Swingarm and Front/Rear Fenders. 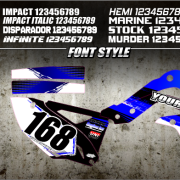 Our Full Custom kits allow you to add you own sponsor logo in the area you request. Select the accent colors to customize the style kit you wish to obtain. Add your name and number for a one of a kind kit. – One proof will be sent by email free of charge each additional proof will be $25. – Full Fender wraps are available for most model with a $25 upgrade fee. – A variety of Chrome colors are available with additional fees of $25 or $35. If logo is not provide a $25 recreation charge may be added to final bill. Ripped Vinyl does its best to follow Copyright/Trademark Laws. Some logos such as Monster Energy, RedBull, Rockstar, and some Brand Manufactures cannot be used. It is Ripped Vinyl right to refuse the reproduction of any logo that may break any Copyright/Trademark federal laws.